The fact that rice is a main stay for half the population of the world. Does not mean that it is the easiest food to prepare. Making good rice was such a challenge for me, that why for many years I used the Uncle Ben's rice in a pouch, made especially for us rice challenged people. 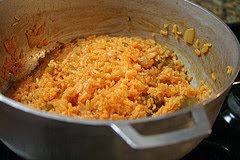 My friend Norma shared with me the secret of making great Spanish rice, this is her family recipe which I will be sharing with you. Here are some some things that I have learned about making good rice. The type of rice you buy matters. .Rice needs to be rinsed. Do not lift the lid off the pan for at least 20 minutes. Measure 2 cups of uncooked rice into the bowl. Fill bowl with water stir, until you see the water turn murky. Strain rice real well. Heat pan to medium with 2 tablespoons of olive oil. Add cleaned rice and fry till the rice changes color about 5 minutes. Make sure to stir rice to keep from burning. 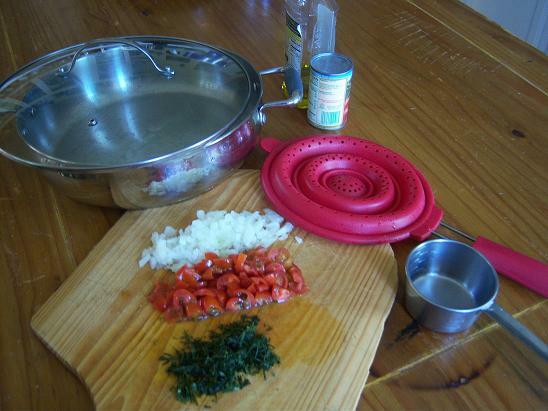 Add chopped tomatoes, and onions fry another 5 minutes. Keep stirring to keep from burning. Add water, bullion cubes, and cilantro. Make sure to smash bullion cube between fingers before adding to rice. Stir well. Spanish rice is one of my favorite. you are right is very hard to make either comes out to mussy or to hard.